On Sunday November 13, 2016, His Eminence KYRILL Archbishop of San Francisco and Western America served the Divine Liturgy at Holy Trinity Monastery in Mexico City, Mexico, celebrating its 10 Anniversary. Several awards were given to those who distinguished themselves in labors for the benefit of the sacred monastery over the years. At the Small Entrance Hieromonks Christopher and Arseny were awarded with the dignity of wearing the nabedrenik for their zealous service to the Church. At the end of the Divine Liturgy the tireless labors of the Superior of Holy Trinity Monastery, Archimandrite Nektary, were recognized through his receiving the Order of St. John, 3rd Degree. Hieromonk Christopher was given an icon in recognition of his missionary labors. 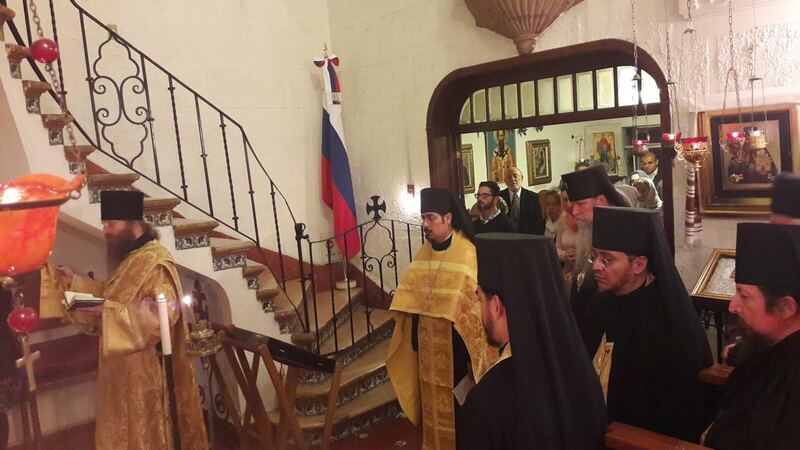 And, His Eminence presented the Church Warden, Prince Aleksandr olegovich Zaitcevsky with a Benedictory Tribute. Despite the recent financial difficulties the monastery has been facing in recent times, the monastic and lay communities of the monastery are strong. All worked hard to mark this anniversary. The choir sang well and the festal dinner was abundant.